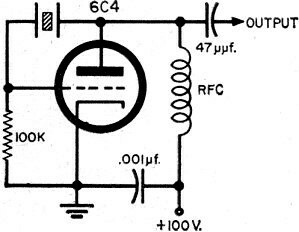 All you need to do is substitute transistors for the tubes used in these fundamental oscillator circuits to bring this article's content up to date. Or, maybe you are the owner of a vintage vacuum tube radio and would like to learn a little about how things were done in the olden days. 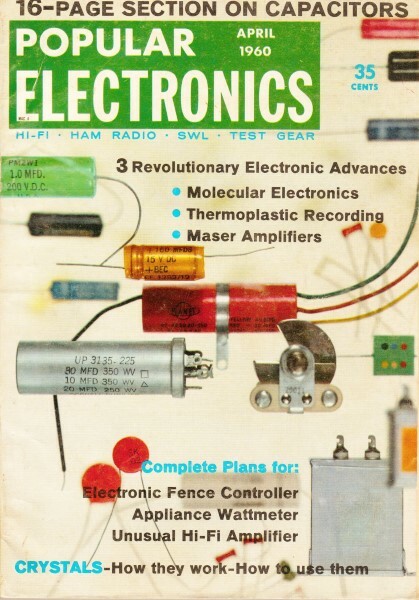 Either way, as with so many aspects of electronic circuits, the basics haven't changed much in the last 100 years. It's all still good. An amateur radio operator, an airline pilot, a police radio dispatcher, a broadcast-station announcer ... sound like a hodge-podge of job holders? Maybe so, but they have at least one thing in common. All make daily use of the peculiar properties of quartz crystals - thin, glass-like plates that keep the world in tune. Crystals are found in almost all commercial and ham radio equipment, but few of their users know how they work. Before we examine the details of crystal operation, let's take time out to define our terms. There are three important words involved: resonance, damping, and piezoelectricity. Resonance means the frequency at which an object will vibrate most easily. Every object has a resonant frequency. Musical instruments - the piano, for instance - are based on this principle. When you strike a key, a hammer hits the piano string, which then vibrates at its resonant note. Damping means the suppression of an object's tendency to vibrate, The more highly damped an object is, the less readily it will vibrate. In the piano, for example, stepping on the loud pedal removes the damping from the strings. Stepping on the soft pedal damps the vibrations even more than usual. Finally, piezoelectricity is a property shared by several substances. It means that the substance generates a small voltage across its opposite sides if it is stretched or squeezed. In addition, applying a voltage to opposite sides of a piezoelectric material will deform the substance as long as the voltage is present. How a Crystal Works. Let's assume that we have a crystal of some piezoelectric substance, and a means of making electrical contact to its opposite sides. Since the crystal has mass, it will have a resonant frequency. If it's jarred - mechanically excited - it will vibrate at that frequency. And if the crystal's damping is light, it will continue to vibrate at its resonant frequency for some time. But remember that our crystal is piezoelectric. By definition, this means that it will develop a voltage across its opposite sides whenever it's stretched or squeezed. The electrical contacts we've connected to those sides will allow us to utilize that voltage. If the crystal's size is such that the resonant frequency falls within the r.f. spectrum - and this is ordinarily the case - we have a generator of r.f. energy. But our generator must be" jarred to be put into operation, and it will operate only until the vibrations die out. For it to be of use to us, we must make our crystal operate continuously. The addition of a special vacuum-tube or transistor circuit to amplify a portion of the crystal's developed voltage and then feed it back to the crystal will keep the crystal operating indefinitely. Such a circuit is called an oscillator and is used to "jar" the crystal electrically at the proper instant to keep its vibrations going. Before looking at several types of oscillator cir­cuits, let's consider the reason for using a crystal at all. Why Use Crystals? Since oscillators can be built without using a crystal - the ordinary superheterodyne radio receiver and the ham's VFO are good examples - the question arises, "Why bother with crystals ?" Actually, a crystal has only one major advantage over a well-built variable oscillator - stability. A crystal's resonant frequency is determined primarily by its physical size. This means that the frequency of a crystal is relatively unaffected by outside influences. There are, however, two outside influences which can change a crystal's frequency. One is widely known, the other almost ignored. The first enemy of crystal stability is heat. Like any substance, a crystal will change in size slightly as it heats or cools - and its frequency is determined mainly by its size. Thus, changes in temperature will be reflected as a drift in frequency. The effect can be serious. In commercial applications, a crystal is usually kept in a tiny oven, thermostat-regulated to maintain an even temperature. Amateur and experimenters' crystals, in contrast, are designed to remain at a fixed frequency under reasonable temperature variations. But overloading the crystal in an effort to extract the last measure of power from the circuit can push its temperature into the "unreasonable" region. Even more serious than the heating problem-and far less widely known - is the matter of shunt capacitance. In an ideal situation, the crystal will "see" no load at all across its terminals. But such a circuit is impossible in practice, since the crystal must feed an oscillator in order to operate. And, with the oscillator connected, some capacitance is unavoidable. This capacitance acts as a load on the crystal, slowing down its rate of vibration and thus lowering its resonant frequency slightly. Depending upon the capacitance in the circuit, a crystal will produce higher or lower frequencies than that specified. Since this effect cannot be avoided, crystal manufacturers assume a standard value of shunt capacitance and build their crystals to give specified frequency when working into that load. For most amateur crystals, the design value is 32 μμf. Since manufacturers can't be expected to know the capacitance involved, most of them refuse to guarantee extremely close accuracy unless they can calibrate the crystal in the actual circuit to be used. Oscillator Circuits. 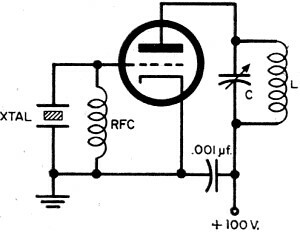 There are a number of circuits that can be used as oscillators. All have two things in common - a means of amplifying the crystal's output, and a way of feeding some of that output back to keep the crystal oscillating. 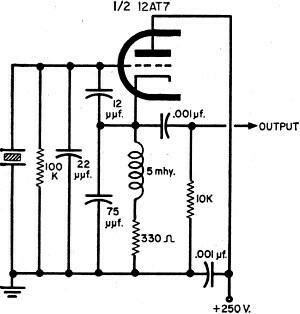 A typical oscillator circuit (Fig. 1) makes use of the tube's grid-cathode voltage to place the crystal in operation. Because the crystal is in the grid circuit, the tube amplifies its output. In a typical oscillator circuit, turning the oscillator on develops a voltage between its cathode and grid, and this voltage shocks the crystal into vibration at its resonant frequency. The vibration in turn develops an alternating voltage across the crystal terminals, which is amplified by the tube. The LC circuit is tuned near the crystal frequency and presents a high impedance in the tube's plate circuit. Consequently, a portion of the amplified voltage is fed back to the crystal and maintains oscillation. Some oscillator circuits are designed to give output only at the fundamental frequency of the crystal - the frequency of the crystal itself. Others are built to provide the fundamental and integral multiples of the fundamental frequency as well. Such multiples are known as harmonics and have frequencies of two, three, four, or more times the fundamental frequency. Still a third variety of crystal oscillator is the "overtone" circuit. A major difference between it and a harmonic oscillator is that the overtone circuit produces only one output frequency-the third, fifth, or other odd harmonic. A harmonic oscillator, in contrast, produces the entire gamut ­ the fundamental, the desired frequency, and other harmonics, too. The Pierce circuit shown in Fig. 2 is typical of a fundamental-frequency oscillator. It operates at the crystal's fundamental frequency, without tuning or other adjustments. Pierce oscillator operates at almost any frequency, but uses only fundamental frequency of the crystal. Plate voltage should be as low as possible. One of the most popular harmonic-oscillator circuits is shown in Fig. 3. This is the Colpitts or "grid-plate" circuit. As shown, it produces useful power output up to the fourth harmonic of the crystal's fundamental frequency, if an LC circuit in the output is tuned to the desired output frequency. Colpitts oscillator gives good output on harmonic as well as fundamental frequencies if LC circuit is substituted for the 10,000-ohm resistor. There are many types of overtone oscillator circuits. The one shown in Fig. 4 is recommended by International Crystal engineers for use with their overtone crystals in the 15-60 mc. range. Overtone oscillator will provide output up to 60 mc. with crystals ground for third-harmonic operation. 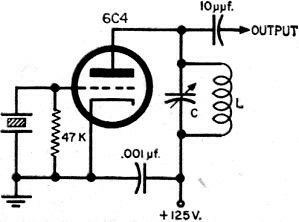 LC circuit must be tuned to output frequency. All three of these circuits are stable. Crystal heating - if operating voltages are kept within the limits shown - poses no problem. If you keep in mind that a crystal is intended to control frequency and not to produce power, you'll have no trouble. Keep power input to the oscillator as low as possible, and let other stages of the equipment provide power output. In both the Pierce and Colpitts circuits, shunt capacitance affects the crystal's operating frequency. Values shown for the Colpitts circuit result in about 32 μμf. across the crystal. In either circuit, a small variable capacitor can be connected in parallel with the crystal to adjust the output frequency slightly. Structurally, the piezoelectric crystal used in radio transmitters consists of a thin plate of Brazilian quartz about 1 1/2" square. There is a contact on either side, and the entire unit is enclosed in a container for protection. The contacts are held in position against the crystal by spring pressure, or, sometimes, they are plated onto the surface of the quartz. Each contact is then connected to one of the base pins. Since the overtone circuit operates differently, additional capacitance across its crystal will have little effect on frequency. If the capacitance is excessive, though, it may keep the oscillator from functioning. Controlling the frequency of a radio transmitter is but one application of the quartz crystal. Although it operates in a completely different way, a crystal is electrically the same as an extremely efficient LC (or "tank") circuit. For this reason, a crystal can replace a tank circuit in any low-power installation. But the major use of quartz crystals today is in transmitter frequency control. Here, they provide precision channels at low cost and enable efficient use of the limited radio spectrum. In fact, these rock-like plates make radio as we know it possible. Their purpose? Keeping the world in tune!